250 in stock Need More ? Originally published: New York: Harmony Books. 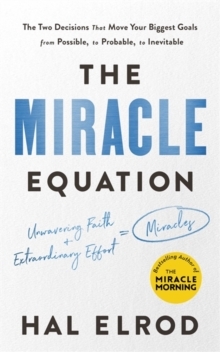 Following on from where the extraordinary international bestseller THE MIRACLE MORNING left off, THE MIRACLE EQUATION shares the secret to unlocking happiness, success, and your full potential. You Are Only Two Decisions Away from Everything You WantThere is a timeless, proven formula that the world's most successful people have used for centuries to tackle their biggest dreams, but it has been overlooked. Hal Elrod, bestselling author of THE MIRACLE MORNING, used it thrive against seemingly insurmountable odds, from overcoming life-threatening health challenges to near financial collapse. The Miracle Equation is that formula, and it consists of only two decisions that guarantee astonishing levels of success and fulfillment: Unwavering Faith and Extraordinary Effort. By establishing and maintaining unwavering faith that you can achieve anything you desire, and then putting inextraordinary effort until you do, your success is inevitable. Using the same strategy as the world's top achievers, you'll create results beyond what you believe to be possible. You'll learn how to replace fear with faith and let go of your negative emotions, accessing your full potential and channeling your energy into attaining positive outcomes. With the Miracle Equation 30-Day Challenge to guide your way, you'll create a step-by-step plan to actualize your miracles and become the person you need to be in order to succeed. 'A simple, proven formula for creating extraordinary results in your life.